High school choir has curricular requirements as do other academic disciplines, but also has out-of-class time requirements. Required concerts and performances take place outside of the school day. This class is comprised of freshman women interested in vocal training, group singing and performances. High school choir has curricular requirements, as do other academic disciplines, but also has out-of-class time requirements. Required concerts and performances take place outside of the school day. This class is comprised of women interested in vocal training, group singing and performances. High school choir has curricular requirements as do other academic disciplines, but also has out-of-class time requirements. Required concerts and performances take place outside of the school day. This class is comprised of men interested in vocal training, group singing and performances. High school choir has curricular requirements as do other academic disciplines, but also has out-of-class time requirements. Required concerts and performances take place outside of the school day. Women’s Choir is a select group of performance singers. Entrance into this ensemble is gained by audition, meeting established prerequisites or at the discretion of the director. High school choir has curricular requirements, as do other academic disciplines, but also has out-of-class time requirements. Required concerts and performances take place outside of the school day. Concert Choir/Chorale is a select group of performance singers. Entrance into this ensemble is gained by audition, meeting established prerequisites or at the discretion of the director. High school choir has curricular requirements, as do other academic disciplines, but also has out-of-class time requirements. Required concerts and performances take place outside of the school day. Chamber Choir is the highest select group of performance singers. Marching Band is a co-curricular course which meets during first semester. This band provides unique and worthwhile performance opportunities for each student involved. Each member is expected to attend all required performances and rehearsals, many of which occur outside of the school day and prior to the start of the school year. Upon the completion of marching band, all freshman band members will be placed in the Freshman Concert Band. This band performs three concerts annually and participates in the MSHSAA festivals. Other performance opportunities are made available for the members of freshman band which include: Pep Band, Woodwind Choir, Brass Choir, Percussion Ensembles, MSHSAA solo and ensemble festivals. Upon the completion of marching band season, students will participate in either Symphonic or Concert band. Membership in either band is based upon a student’s audition. These bands perform three concerts annually and participate in the MSHSAA sanctioned large ensemble festival. Other performance opportunities are made available to these students including: WW choir, Brass Choir, Pep Band, Musical Orchestra, solo and small ensemble festivals. Concert Orchestra is a non-auditioned course. In this course students will solidify musical concepts such as key signatures, notes outside of the first position, and tone quality. Concert Orchestra will prepare students for Symphonic Orchestra. 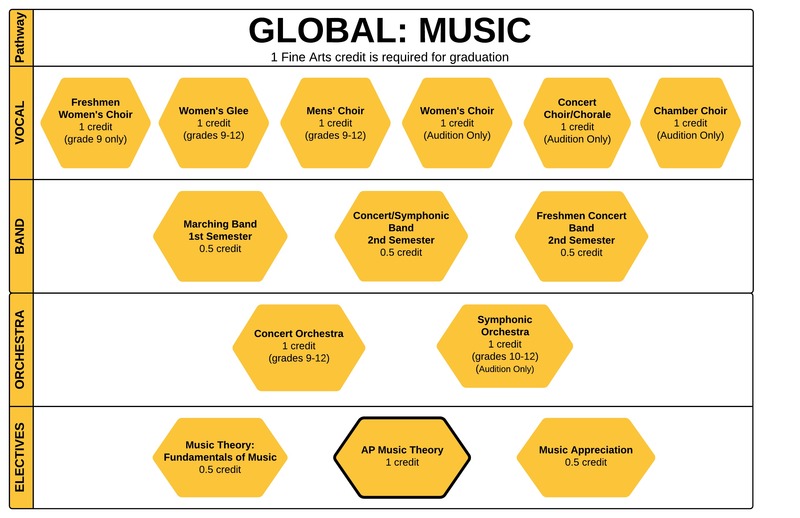 Students enrolled in Symphonic Orchestra may enroll in Concert Orchestra to learn a secondary instrument and or fulfill a leadership role within the orchestra. Students enrolling for Symphonic Orchestra should have completed a year of Concert Orchestra and passed the audition for Symphonic Orchestra. Students will be expected to have knowledge of first through fourth position, solid tone quality, and basic knowledge of music theory. Students will experience and study the elements of music by exploring a wide range of vocal and instrumental styles. No previous musical experience is necessary for this class. This course will study the basics in music theory and composition. Key content areas of study will be harmony, melody, composition, form and rhythm. This advanced music course will have a strong emphasis on listening skills involving melodic perception, harmonic function and recognition of compositional techniques. In this class, the ultimate goal is to develop a student’s ability to recognize and understand the basic material and process of music that is heard or read in score.